The new Autodelta 147 GTA AM 3.7 Super pushes the engine and chassis dynamics of the Alfa 147 GTA to its most extreme point yet. This new version builds on the impressive upgrades we have already wrought to the Alfa V6 engine: capacity increased to 3,750cc, a remapped management system and a Ferrari-derived throttle body, coupled to the fitting of a Rotrex C38-81 supercharger delivering 0.75 bar of boost; now all taken to a new even higher level - bringing the car’s maximum power up to 422 bhp at 7,000 rpm (standard Alfa 147 GTA power is 250bhp at 6,200 rpm) and torque significantly improved to 520 Nm. And although it was perfectly at home on the high-speed famous Grand Prix track at Spa-Francorchamps last weekend this is a highly refined car which is just as suitable for any day-to-day driving scenarios; Autodelta’s engineers having ensured that the Alfa 147’s practicality was been perfectly blended with its sheer performance. 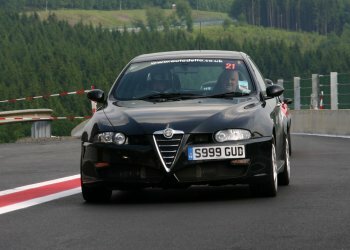 Autodelta’s presence at Spa-Francorchamps was also the latest step in an on-going Research & Development programme that has seen the London-based aftermarket Alfa Romeo engineering firm testing on major circuits in recent months, including Silverstone, Donington Park and the Nürburgring. Also in track action at Spa-Francorchamps was the new 341 bhp Autodelta Brera J5 3.2 C. The programme for this car – which was commercialised in February – centred around our on-going tyre development programme with Dunlop; it also though included testing of several components which are destined for the limited-edition J20 ‘anniversary model’, as well parts which are expected to feature on our forthcoming bespoke Alfa 159 range. As usual the Autodelta team was joined by several of our customers who took the opportunity to get track time with their cars. These included Luciano Capiello’s dramatic Autodelta 156 GTA AM 3.7 Super, Jason Harris’ award-winning Alfa 147 2.0 Supercharged, and Mladen Cvorovic Autodelta SZ Supercharged. Jano Djelalian, Autodelta Managing Director said: “We were delighted to introduce the Autodelta 147 GTA AM 3.7 Super at SpaItalia in front of a knowledgeable and interested audience, and the level of support we received was very pleasing. The SpaItalia organisers had done a wonderful job as usual, making it the perfect setting to bring the new car to, and the very sunny weather also helped. The brand new F1 pit garages are excellent; they really raise the standard and made everything more convenient. In track action at Spa-Francorchamps during the SpaItalia weekend was the new supercharged 341 bhp Autodelta Brera J5 3.2 C.
The most powerful high performance bespoke model yet to be introduced by Autodelta, the 147 GTA AM 3.7 Super (above) made its first official public appearance when it was introduced during the SpaItalia weekend (2nd – 3rd June). 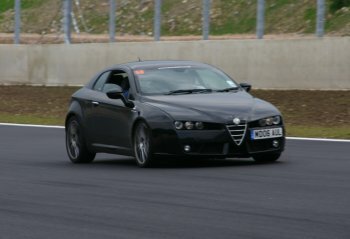 Paul Paggiosi, Autodelta Test Driver said: “The two days went very much to plan. This is the most suited circuit I have ever found for this car, almost as if it had been designed it. It enables you to unleash the full power of the car. The revised suspension settings we have incorporated worked well around what is a very fast and demanding circuit, the car’s handling capability was quite superb. On the Saturday when we were demonstrating the ability of the new car and taking passengers we were running in the full [422 bhp] customer specification, on road tyres and with a heavy fuel load. On the second day we were able to take the opportunity to test some new development parts and, running on track tyres, we were able to post very representative lap times. We’re all delighted with the progress that has been made to this latest extension of the Alfa 147 GTA project.